Pest description and crop damage Several aphid species attack apricots, including the hop aphid, mealy plum aphid, and thistle aphid. Aphids tend to be teardrop-shaped, translucent green insects that measure less than 0.125 inch long. Adults of the thistle and mealy plum aphids are pale bluish green; mealy plum aphid has a white, powdery coating. Both adult and immature aphids feed on plants by injecting their needle-like mouthparts into green tissues and sucking out plant juices. Early in the season, aphid feeding can stunt and deform shoot growth. Later in spring, feeding can lead to leaf curling, or, at high aphid abundances, cause shoot dieback and damage fruit. Aphids excrete large amounts of sticky honeydew that can cover surfaces of leaves and fruit. Fungi and molds colonize the honeydew and can leave dark spots on the surface of the fruit, compromising appearance and quality. Newly hatched mealybug nymphs, or crawlers, are about 0.06 inch long, pink-to-salmon colored, coated with a white powder wax, and very mobile. The more mature, sedentary nymphs are pink-to-purple with waxy filaments giving them a whitish cast. Adult females resemble nymphs and are about 0.19 inch long and quite mobile. Later in the season, mealybugs may produce copious amounts of honeydew. This honeydew may be colonized by black sooty mold that can discolor leaf and fruit surfaces. Biology and life history Aphid species associated with apricots tend to overwinter in fruit trees as dark rice-shaped eggs hidden in cracks and crevices along tree bark, twigs and buds. There are multiple aphid generations each year. Later generations reproduce asexually and bear live young (foregoing the egg stage). 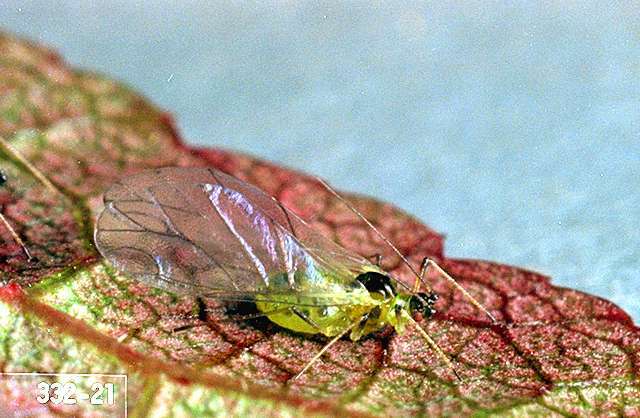 In the late spring and early summer, most aphid populations develop wings and leave fruit trees for a multitude of summer hosts like vegetable crops and weed species. Grape mealybug overwinters as crawlers in egg sacs beneath bark scales and in cracks. Crawlers start emerging from egg sacs at the beginning of bud swell and begin feeding on the bases of buds. As buds open, the crawlers go directly to new shoots and leaves. Once settled, the crawlers start feeding, become progressively sedentary and harder to kill. First generation nymphs mature during late June and July in the Northwest. Adult males appear first, mate with last instar nymphs or adult females and die. Receptive females release a pheromone to attract males. Mated females migrate to sheltered areas, lay eggs and die in the egg sac. A partial second generation matures in late August and September. Pest monitoring Observe shoots for aphid and mealybug presence prior to budbreak. An effective management is best undertaken while the aphid and mealybug populations are at their lowest density early in the spring. A number of parasitic wasps, predatory lacewings, lady beetles, syrphid fly larvae, and other insects play an important role in controlling aphids and grape mealybugs. 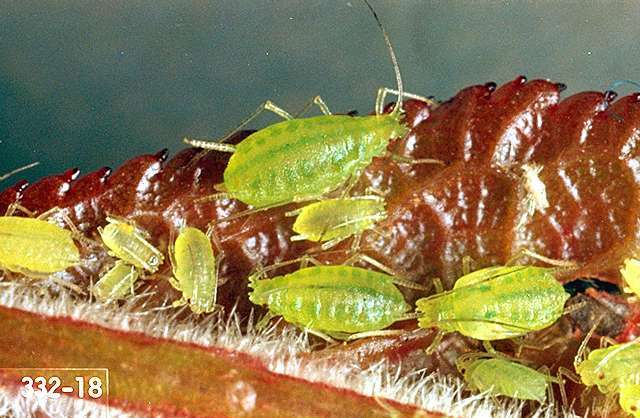 Wash aphids from plants with a strong stream of water or by hand-wiping. Aphid populations tend to be higher in plants that are fertilized too liberally with nitrogen. Avoid excessive watering, or late season nitrogen applications that produce flushes of succulent growth. Most aphid species leave apricots in June-July for summer hosts and return to fruit trees in the autumn. Dormant to delayed dormant applications target overwintering egg and newly-emerged aphid populations when their abundance in the fruit trees is lowest; thorough spray coverage of exposed fruit tree surfaces is essential. Sprays applied during the growing season target rapidly increasing aphid populations and for best results should be applied before leaves curl and protect aphid populations from spray residue. These applications may reduce mealybug and leafroller abundance as well. Applications to mealybugs during earlier life stages can be more effective due to a reduced quantity of protective wax covering their bodies. imidacloprid-Soil drenches may have residual activity in woody plants lasting for 12 or more months. If short-term management is the goal, consider other approaches. Mealybugs only. kaolin-When sprayed on leaves, trunks, and fruit, kaolin acts as a repellant to insects. Some formulations are OMRI-listed for organic use. horticultural mineral oil (rates vary; check product label) + esfenvalerate (Asana XL) at 2 to 5.8 fl oz/100 gal water (4.8 to 14.5 fl oz/a). REI 12 hr. May disrupt beneficial mite populations. Extremely toxic to fish and aquatic invertebrates; avoid spray drift and surface runoff. In some cases, these products have caused more damage than good by reducing beneficial insects. For best results, apply insecticides before leaves begin to curl, and before petal fall. diazinon (Diazinon 50W) at 1 lb/100 gal water (4 lb/a). REI 4 days. Diazinon is toxic to bees. Do not use if bloom is present and/or bees are foraging in the orchard. Note: Diazinon is limited to one application as a foliar spray per season. phosmet (Imidan 70W) at 0.75 to 1 lb/100 gal water (4.25 lb/a). REI 7 days. Extremely toxic to fish; avoid spray drift and surface runoff. acetamiprid (Assail 30SG) at 5.3 oz/a. PHI 7 days. REI 12 hr. diazinon (Diazinon 50W) at 1 lb/100 gal water (4 lb/a). PHI 21 days. REI 4 days. Diazinon is toxic to bees. Do not use during bloom or if bees are foraging in the orchard. Diazinon is limited to one application as a foliar spray per season. imidacloprid (Provado 1.6F) at 2 fl oz/100 gal water (4 to 8 fl oz/a). PHI 0 days. REI 12 hr. Do not apply during pre-bloom, bloom, or when bees are actively foraging.